The 23rd Annual Honolulu Festival will be held March 10-12, 2017 at various locations in Honolulu and Waikiki. The Festival's long standing theme, "Pacific Harmony," reflects the Honolulu Festival Foundation's vision to share the many cultures of the Pacific region with the people of Hawaii and those visiting from all over the world. Hawaii's premier cultural festival, the 23rd Annual Honolulu Festival, will highlight the people and diversity of Asia-Pacific through an impressive showcase of arts, culture, and entertainment - all of which is free to the public the weekend of March 10-12. The Honolulu Festival's sub-theme for 2016 was "Cultural Harmony, Journey to Peace." The 2017 theme will be announced early in 2017. The Honolulu Festival's goal is to help perpetuate the strong cultural and ethnic ties between the people of Asia-Pacific and Hawaii. The Honolulu Festival has gone through a gradual process of development in recent years. What was once an event featuring Japan and Hawaii's culture has expanded to include representatives from Australia, Tahiti, Philippines, Republic of China (Taiwan), China, Korea and the U.S. Mainland. Participation by a variety of local ethnic groups has also increased each year. More than 5,000 participants and visitors from Japan and other Pacific Rim countries will come to Honolulu specifically to take part in the Festival, giving a boost to Hawaii's tourism economy by generating more than $10 million in visitor spending and nearly $1 million in tax revenues. Let's take a look at some specifics of the Festival. Friday, March 10, 7:00 p.m. - 8:30 p.m. - Friendship Gala at the Hawaii Convention Center. Saturday, March 11, 10:00 a.m. – 6:00 p.m. – Craft Fair at the Honolulu Convention Center with over 100 vendors exhibiting from Hawaii, Japan and all over the world. Saturday, March 11, 10:00 a.m. - 6:00 p.m. - Cultural and Arts Performances at three locations: Hawaii Convention Center, Waikiki Beach Walk and Ala Moana Center. Sunday, March 12, 9:00 a.m. - Honolulu Rainbow Ekiden where runners are invited to race through Waikiki in Hawaii's second annual "Ekiden" (long distance relay) race. A tradition of Japan for over 90 years, Ekiden features teams of 3-5 runners competing in this scenic ocean view route around Diamond Head. Registration and more information are available at HonoluluEkiden.com. Sunday, March 12, 10:00 a.m. - 3:00 p.m. - Cultural and Arts Performances at three locations: Hawaii Convention Center, Waikiki Beach Walk and Ala Moana Center. For a complete list of performers visit the Honolulu Festival website. On Friday March 10, 2017 a Friendship Gala will be held from 7:00 p.m. - 8:30 p.m. at the Hawaii Convention Center featuring Oahu's top restaurants and exciting cultural performances by Honolulu Festival artists. The Waikiki Grand Parade down Kalakaua Avenue in Waikiki, featuring performers and floats, will take place on Sunday, March 12 at 4:00 p.m.
Back again for the sixth year will be the spectacular Nagaoka Fireworks Show following the Waikiki Grand Parade on Sunday March 12. 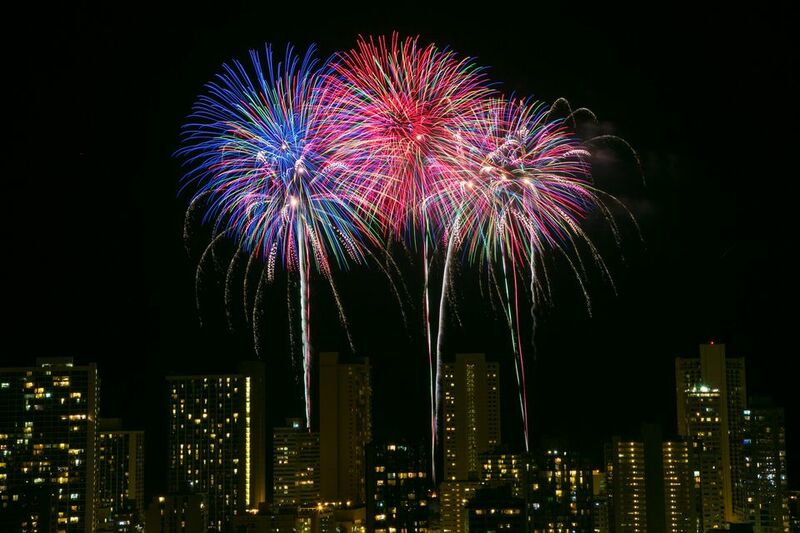 Originating from Nagaoka City, Japan, this fireworks extravaganza will light up the skies over Waikiki.